I’m your host, Chris Mallory. I love everything about flying and airplanes: building them, flying them, fixing them, flying them, and flying them. Building my own airplane has always been a dream, and I’m having a great time making it come true. I have been flying high-performance aircraft for twenty years as a Weapons Systems Officer, WSO, in the United States Air Force. That means I sit in the back seat of the fighter and run the radar and guide the bombs to the target. I also have a full set of controls and have logged quite a few hours on the stick. I’ve got over 3500 hours flying in the T-37, T-38, T-43, T-1, T-39, T-6, F-4, F-111 and F-15E. 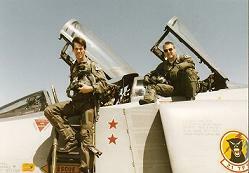 I’ve also flown in the F-15D, F-18 and F-16. I’ve known since I was a little kid that I wanted to fly jets. Looking back I can’t believe I’ve been able to do all that. On the civilian side, I hold a multi-engine land, instrument rating and have over 750 hours flying “little” airplanes. I have my Airframe and Powerplant, A&P, license, and am waiting to retire from the Air Force before I get my Inspection Authority, IA. 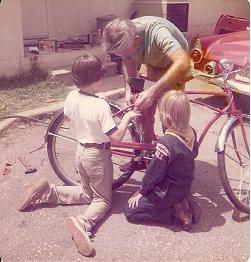 The first mechanical thing I remember doing was the “frame-up restoration” on my bicycle that my dad and I did when I was 10. Since then I have moved on to bigger projects with more horsepower. I’ve restored a 1937 Chevy ½ ton pickup truck and built a Big Bear Chopper motorcycle. So why not build my own airplane? But the RV-8 doesn’t complete the list. My wife is worried because she knows that waiting in the wings are the plans for a full sized Fokker-DR1 triplane (the Redfern plans), the dream to rebuild a Beech-18, and the fantasy to own a P-51. See her thoughts here. I’m having a hard time convincing her that the Reno Air Races are safer than flying jets in combat, but I haven’t given up yet. Hey, if you have questions about my RV-8, or something you'd like to see on this site, please Contact Me.